The Rolling Stones wave to the crowd after their halftime performance at Super Bowl XL in Detroit, Michigan on February 5, 2006. The Rolling Stones were the resident bad boys of the British Invasion, but apparently at one point they weren’t above trying to sell some breakfast cereal. A British ad for Rice Krispies from the early 1960s has been making the rounds online, and the jingle is unmistakably the work of Mick Jagger, Keith Richards and company. Best estimates put the original broadcast of the ad at sometime in 1963 or 1964, and it is believed to have had a short run on British television. While the clip of the ad has been on YouTube for a decade, it’s finding new life this week. If the Rolling Stones doing ads for food products feels vaguely familiar, that might be because the band was mentioned in an episode of “Mad Men,” during which Don Draper (Jon Hamm) attempted to secure the band for a Heinz Baked Beans commercial. Don even makes mention of the cereal commercial to a young Stones fan. 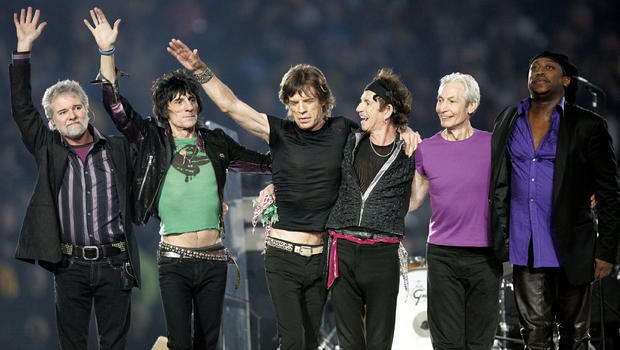 In other Rolling Stones advertising news, the band reportedly received $1.5 million from Mercedes Benz for permission to use “Sympathy for the Devil” in a 2013 Super Bowl ad.